No animals harmed in filming? 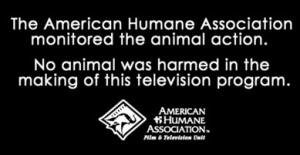 At the end of films using animals, a comforting notice is flashed on screen with an American Humane Association's (AHA) "No Animals were Harmed" credit. Those who support the AHA trust their assessment even though some of the scenes with animals seem particularly violent. But with the respected animal protection group monitoring each film set with animals, the animals must be safe, or so it is reasoned. According to The Hollywood Reporter (THR – 1/10/14) that statement is a lie. In the racetrack drama Luck, several horses died in the filming. Harmful incidents, injuries, accidents, and animal deaths occurred in films such as Life of Pi and The Hobbit. And that is just the tip of the iceberg. Where was the AHA during these horrific violations of animal welfare? Probably counting the $2.4 million they received from producers during the current annual cycle. On January first of this year, 2014, they were set to receive a $500-a day "service fee." The overlooking of the obvious, by them, now makes sense. What a damning indictment of an organization so trusted by animal lovers, where money is more important to them than the well-being of the animals they have vowed to protect and raise money for. In The THR report, "critics focused on the conflict of interest inherent in the entertainment industry bankrolling its regulator." What is especially troubling is that liberals in general are the greatest protectors of animals, much more so than conservatives. This is why this writer makes a point to hug a liberal every day. Since Hollywood is controlled by liberals, one would expect better. However, the money is so great, indeed at some points obscene, that the focus centers on getting out that product no matter who or what it hurts in doing so. The only concern is to make a film as realistic as possible, which will bring in huge profits. In other words, "the bottom line is all that counts." Every other consideration is tossed aside. It is like the quote of Pop "Star" Lady Gaga on a blog (that has since been scrubbed). After learning the the UGG boots she wore so proudly were made from the fur of dogs who were skinned alive in unspeakable agony, she shrugged it off by saying, "The furs make be more beautiful, that's all that counts." According to THR, a new animal agency titled Movie Animal's Project (MAP) is in line to take over the monitoring duties. It will be run by Barbara Casey, who was a high ranking official in the AHA's Studio City-based Film TV Unit but was fired after she aggressively stood up to HBO and producers over safety issues regarding their reckless use of animals. This looked promising. With hopes up, it was disturbing to learn that MAP has chosen to "rely on the same fundamental funding structure as the AHA." How's that again? No matter what reforms they claim to have in place, they still are recipients of the same pay-offs. As Ed Steward, president of the Performing Animal Welfare Society observes: "If they're getting money from the same people, they're already compromised. Now you're just into a cat-fight between two organizations doing versions of the same thing."